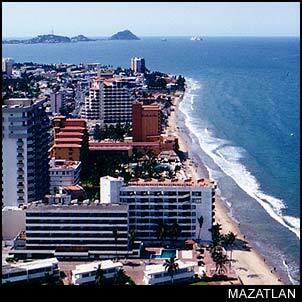 Mazatlan began as so many other beach destinations in Mexico. A bustling port city with a commercial fishing industry. In spite of Mazatlan becoming a tourism destination, the fishing industry is as strong as ever. Each day brings in entire fleets of ships with tons of shrimp and fish. As a tourist you may say so what . . . so you will find great deals on melt-in-your-mouth sea food here! If you are looking to do some fishing of your own, there are plenty of deep sea fishing boats that will take you out to get the catch of the day yourself. Though most tourists are more interested in the sun, sand and water sports. . . and Mazatlan has all of those things. It has now been quite a few years since Mazatlan was on the top of anyones list as the vacation destination of choice. As in Acapulco, the tourist machine is growing older and the once new resorts are getting older as well. The up-side of this is that it gives the city a flavor of glory days gone by and there are great deals to be found on hotel rooms. When walking the beaches in Mazatlan, it is easy to spot the now aging generation of American tourists who have been coming here year after year. Then they bring their children who will eventually return and bring theirs. It may not be the uber resort of Cancun, but it is a comfortable place to stay . . . and the more you stay, the more it begins to feel like your home away from home. 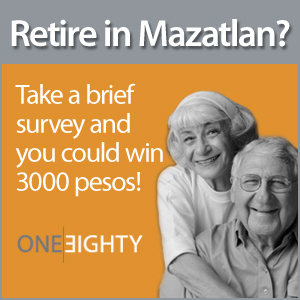 That may explain why Mazatlan is more and more favored as a place people come to retire. Well, that and the fact that housing and the cost of living are far less than the US. To check out Mazatlan real estate, you can visit VivaReal. They have a comprehensive database of property listings for sale. Don't get me wrong though . . . Mazatlan is not just for the geriatric generation . . . it has bars, clubs, and hopping nightlife that keeps the 20 somethings sleeping until past noon. If you want to slow down there is Stone Island. The perfect place to relax in true Mexican fashion and forget that there is a resort city with a major port just a few minutes away. And, lest we forget . . . what is now known as Old Mazatlan is an example of how the Spanish colonial architecture can transport your mind out of the tourist zone and into the true flavor of Mexico. When all is said and done . . . Mazatlan is the kind of place that grows on you and if you visit too often, it may cause you to grow roots.